Last week I shared the results of some fairly extensive research into the attributes of companies that scale growth. One aspect that I didn’t mention, but that is inherent in scaling growth is the focus and importance they place on developing and maintaining the alignment between sales and marketing. The vision that most executives have about how sales and marketing works looks like this. Marketing “builds the brand,” creates awareness and drives interest and leads. Seamlessly the sales team picks up these leads and makes instantaneous contact where the prospect welcomes them for a meeting. That meeting quickly turns into a proposal that is readily accepted and funded. Growth becomes effortless. While there’s certainly some hyperbole in this scenario, it’s not that far from the way that executives feel like sales growth should occur. Of course, reality is quite a distance away from this vision. So much so, that many mid-market companies actually question the real value of marketing to begin with. I have to admit that I used to be one of those people. I though marketing was a nice-to-have luxury that most companies couldn’t afford. As I’ve shared before, for the vast majority of organizations, branding is crap. When looing to enhance B2B sales results, the worry should be more about direct response rather than branding. This leads to the nature of the conflict between salespeople and marketers. The problem, fundamentally, is that marketing’s job tends to end too early and sales’ job tends to start too late. 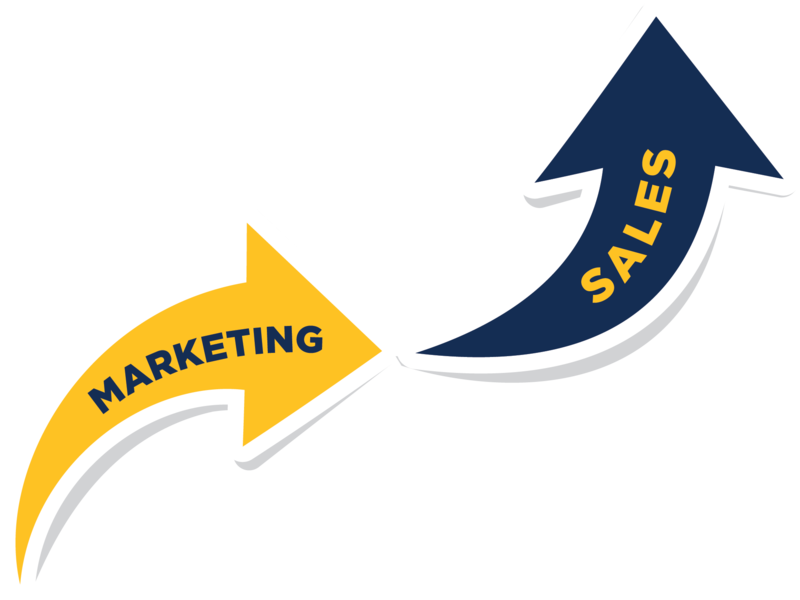 As the graphic above shows, there’s a chasm between marketing and sales. Effective marketing does in fact generate leads, but leads do not directly translate into buyers. 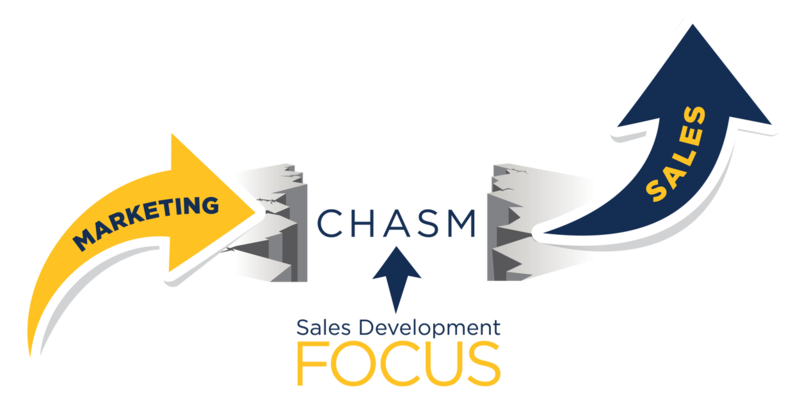 The net result is that much of the momentum (and leads) that are created by marketing fall into the chasm, and only a small percentage of the impact marketing should be having translates to leverage for the sales team. Solutions have multiplied in complexity. Increased competition has cluttered and confused the marketplace. Customer needs and buying processes have increased in complexity. The zero-moment-of-truth has both empowered customers and confused them. There’s a third piece to the puzzle that’s required to systemically generate leads at increasing volumes, while also turning those leads into bona fide, sales qualified leads (SQL) and opportunities. This function, increasingly referred to as Sales Development is becoming increasingly important to those organizations looking to accelerate growth, in a predictable and sustainable manner. The focus on sales development ensures that leads are managed effectively, while your new sales team is able to stay focused on managing sales opportunities and your marketing team concentrates on their critical roles as well. The sales development function, as defined by Trish Bertuzzi of The Bridge Group, combines data analysis tools, email nurturing and phone prospecting teams together in a specialized role that is only about creating SQLs and preparing them for new sales people. Sales development is the missing piece that reinforces alignment between marketing and sales. Such an approach ensures that inbound leads are properly managed and the marketing qualified leads (MQLs) are given the personalized attention they need to maximize conversion opportunities. When I share my thoughts on the sales development function, growth companies quickly get the value of such a focus. The question that almost immediately follows is whether the discipline should fall under the purview of sales or marketing. I’ve become convinced that the answer is neither. The problem is that sales development, while complementary to both marketing’s and sales’ focus, falls between them. When it’s put under the realm of marketing or sales, it typically fails to get the attention that it needs, and is driven by the culture and approach of the primary discipline. The same thing happens when sales or marketing doesn’t have a leader dedicated. On the surface you would think that this isn’t required. After all, should they be naturally aligned? While all of the disciplines have responsibility for revenue growth, the fact is that left to their own device, they’ll approach the issue from such different perspectives that alignment can’t happen. Marketers tend to view the world through a long-term, rules driven mindset. Salespeople, on the other hand, tend to view things from an opportunistic, shorter-term, “everything is an exception” mindset. Strategic planning, service level agreements and effective briefing and debriefing processes all work to bring marketing and sales into alignment. A sales development perspective creates a completely different mindset. Successfully managing sales development representatives (SDRs) is different from managing field salespeople, and totally different than managing marketers. Inbound marketing takes a different mindset than the traditional marketing function does, and is very different from a branding mindset. These three functions must work together, collaboratively. Like the Three Musketeers, it needs to be one for all and all for one. In larger organizations, these three disciplines should report through a Chief Revenue Officer (CRO). In smaller organizations, the CEO is the de facto CRO. Such a specialized focus ensures that a company is giving full attention to its revenue creation process, and allows the company to allocate resources more effectively to drive their goals and objectives.